Enterprises are experiencing information overload. Dozens of systems generate reports, slice and dice data and collect it from every possible data point within the enterprise. With all this data, enterprises are beginning to see how effective delivery and sharing of information improves the process of making informed business decisions. 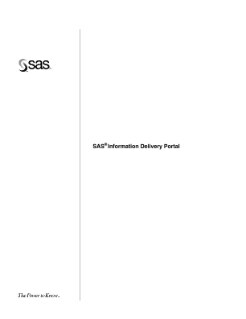 This white paper provides a detailed overview of the SAS Information Delivery Portal, a powerful vehicle for delivering enterprise information to the right people at the right time. The paper describes the state of enterprise information and provides a roadmap and business scenario for implementing the SAS Information Delivery Portal. You will learn about the flexibility of the portal and about its architecture, functionality and administration.